Lothian Thistle had to work hard to overcome a fighting Ormiston side in Qualifying League Section B but won 2-0 thanks to a deflected Kevin Brown free kick just before the break and a last-minute strike from substitute Samuel Nhamburo. They soon had Ormiston under pressure from the kick-off but it was the visitors who had the best chance on the half hour, however, the effort was blasted just wide of the target. The Lothian strikeforce finally forced a mistake from outside the box just before the break and Kevin Brown’s shot took a defection to wrong foot the keeper and find the net. The home side were comfortable throughout but couldn’t find the net again until with almost the last kick of the game when Nhamburo stroked home a cross from the left. Lothian manager Raymond Carr was on holiday so it was under-20s gaffer George Thomson who took the team. “We had a makeshift line-up today because we had holidays and injuries so I pulled in three of my team,” said Thomson. Bonnyrigg continued to ramp up the pressure on teams around them with a solid 10-0 thumping of Inverkeithing in Section F.
The goals started early with Dean Hoskins finding the net followed in quick succession by goals from Kieron McGachie, Lee Currie, Neil Martyniuk, with a double, Louis Swanson, Kyle Wilson and Stevie Thomson, both with doubles. Musselburgh had a 5-0 win at home to Dunipace in Section H with goals from Nathan Evans, Mathu King, Gary Nicholson, Liam Gregory and Bradley Whyte. Easthouses did even better than Bonnyrigg slamming 11 past Tweedmouth and conceding just two in Section B. Graeme Young scored five for Burgh. Also on the scoresheet were Gary Shearer, Craig Beattie, Paul McDermott, Steven Nethery and Stephen Barrie. Dalkeith Thistle won 3-1 in the derby at Haddington in D. Goals were scored by Duncan Muir and Paul Tansey notched a double. Blackburn United lost 5-1 at home to Tranent in Section A while Newtongrange Star and Broxburn Athletic served up a 2-2 draw. 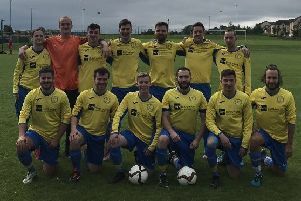 Dunbar United beat Edinburgh United 2-1 in Section E with goals from Dean Ballantyne and Chris King.